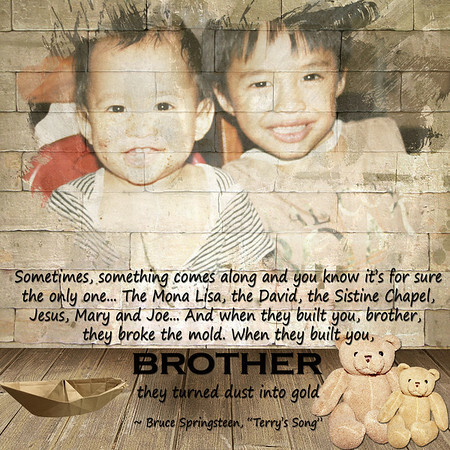 While checking out our scanner software because I have a lot of scanning and printing to do for the boys' party, I chanced upon this quote and just had to scrap it. Yes, I was also downloading digiscrapping kits... I always multi task after all, or try to. Anyway, I got goosebumps reading the quote and thought about how i'd love for my boys to be each other's keeper... and to think of each other as so unique and so indispensable and necessary. No one else will be like their brother. So, I scrapped away... then checked out the rest of the song. Yikes. It seems to be some sort of eulogy to a departed brother. But somber mood aside, dead or alive, I still want Yakee and Yamee to think the world of each other. I have so many wishes for my kids... but this one is sooo close to my heart. Because... it would mean we've really raised them with the idea that love gets multiplied... not divided between the two of them.